A “Top Rated” SEO Award in the ninth annual DrivingSales. Dealer Satisfaction Awards, presented at a special event in conjunction with the 2019 National Automobile Dealers Association (NADA) Convention & Expo. 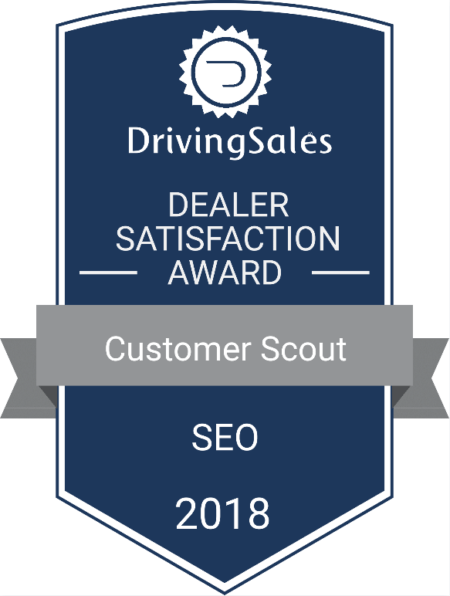 Customer Scout Automotive SEO received a top dealer satisfaction ranking in the SEO category, as determined by the thousands of auto dealers who are part of the DrivingSales.com community. “It is an honor to receive this prestigious award from DrivingsSales.com, which is the largest automotive social network in the world. Without our Dealers, DrivingSales, and the efforts of our stellar employees this award would not have been possible. From all of us at Customer Scout Inc., we sincerely thank our Dealers and DrivingSales for this award.” ~ Sean Szymanski, CEO, Customer Scout, INC. Customer Scout SEO generates stellar results for our customers consistently because we take a comprehensive approach to developing each customer’s marketing campaign. This includes the successful and strategic use of local SEO strategies, geo fencing, content writing, business listings and other advanced techniques. Rather than develop a campaign and see how well it performs, we regularly review and analyze data so that we can make intelligent revisions. In this way, we are able to improve or maintain excellent results for our clients. The DrivingSales Dealer Satisfaction Awards measure dealer satisfaction with vendor products and services, and are based on cumulative ratings tallied and verified over the calendar year (January – December) at DrivingSales.com Vendor Ratings DrivingSales Vendor Ratings is the industry’s only neutral, comprehensive vendor rating forum featuring real-time peer reviews and honest competitor comparisons, and provides dealerships with important information from actual customers who have hands-on experience using vendor products / solutions in their stores. Each rating is verified as coming from an actual dealership employee. DrivingSales is a professional network serving the auto industry with dealer-driven news and information, online training, and performance data, all to enable dealers to make critical business decisions at their dealerships. DrivingSales’ mission is to connect progressive dealership professionals to the people and information they need to maximize their success. Founded by a third-generation car dealer, and opened up to the industry in 2008, today DrivingSales has registered users in over 50% of new car dealerships in the US and is active in several other countries around the globe.